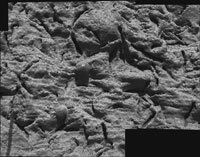 This image, taken by Opportunity's microscopic imager, shows a portion of the rock outcrop at Meridiani Planum, Mars, dubbed "Guadalupe." Scientists have concluded the part of Mars that NASA's Opportunity rover is exploring was soaking wet in the past. Evidence the rover found in a rock outcrop led scientists to the conclusion. Clues from the rocks' composition, such as the presence of sulfates, and the rocks' physical appearance, such as niches where crystals grew, helped make the case for a watery history. "Liquid water once flowed through these rocks. It changed their texture, and it changed their chemistry," said Dr. Steve Squyres of Cornell University, Ithaca, N.Y., principal investigator for the science instruments on Opportunity and its twin, Spirit. "We've been able to read the tell-tale clues the water left behind, giving us confidence in that conclusion." The first views Opportunity sent of its landing site in Mars' Meridiani Planum region five weeks ago delighted researchers at NASA's Jet Propulsion Laboratory, Pasadena, Calif., because of the good fortune to have the spacecraft arrive next to an exposed slice of bedrock on the inner slope of a small crater. At the same location, the rover's Mössbauer spectrometer, which identifies iron-bearing minerals, detected a hydrated iron sulfate mineral called jarosite. Germany provided both the alpha particle X-ray spectrometer and the Mössbauer spectrometer. Opportunity's miniature thermal emission spectrometer has also provided evidence for sulfates. For information about NASA and the Mars mission on the Internet, visit http://www.nasa.gov . Images and additional information about the project are also available at http://marsrovers.jpl.nasa.gov and http://athena.cornell.edu .